“Meet the Designer Cats with Wild Blood”, Vox video by Dion Lee and Mac Schneider (10 min). The film documents the efforts of a young man to develop new breeds of domestic cats with the markings of some wild cats, especially leopards, ocelots and servals. People owned wild cats until perhaps the 1960s when local laws were tightened. Typically, the male offspring of a hybrid may be infertile, but several generations of females are possible, and ownership becomes legal at a certain generation. The generations are numbered as F1 to F6 etc. The savannah is a hybrid of domestic cat and serval. These cats may need more outdoor space for hunting and not be suitable as indoor pets. But they will tend to be loyal to humans who have raised them. This is similar to bobcats and lynxes, wildcats that are not suitable as pets but who will remember humans they have met and who have fed them, and they may want to return, even over considerable distances. I can remember staying in a friend’s apartment in New York in 1980. While he was out, as I got up, the cat surrounded me, and led me to the kitchen, and the exact spot in the refrigerator for his food. Cats can communicate complicated messages to humans they don’t even know, almost as rudimentary speech. Their intelligence is often compared to dogs and that of small children, but they have outdoor hunting and survival skills human children or adults don’t have. 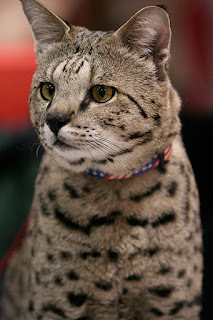 Wikipedia attribution link for savannah F2 cat photo, galawebdesign, CCSA 3.0.